Sand dunes and the tall green grass continue along the shores of the Pinware River. This stock photo shows the rolling sand dunes along the Pinware River in the Pinware River Provincial Park, Pinware, on a foggy morning, along the Labrador Coastal Drive, Highway 510, Strait of Belle Isle, Viking Trail, Trails to the Vikings, Southern Labrador, Labrador, Atlantic Canada, Canada. 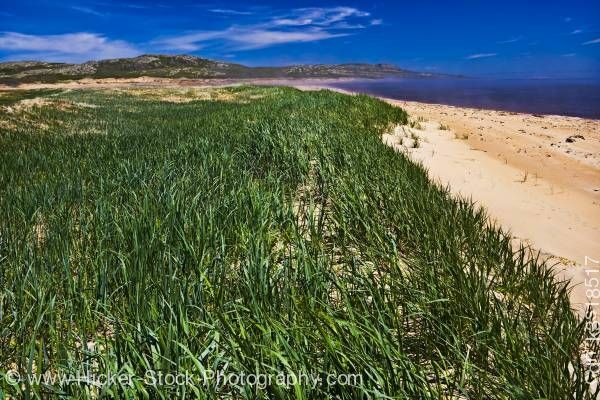 A view of the tall green grass along the rolling sand dunes continues along the shores of the dark blue Pinware River. In the distance, past the rolling sandy dunes is a wonderful view of a mountain range. The dark mountains sit under a bright blue sky. A soft spreading of clouds adds to the impressive view. Sand dunes at the mouth of the Pinware River in the Pinware River Provincial Park, Pinware, on a foggy morning, along the Labrador Coastal Drive, Highway 510, Strait of Belle Isle, Viking Trail, Trails to the Vikings, Southern Labrador, Labrador, Atlantic Canada, Canada.